The following is another update from the Mayo Clinic team that was in the Democratic Republic of the Congo last week, written by Dr. Deborah Rhodes . "Dr. Sean Dowdy and Dr. Emanuel Trabuco had another long day in the OR, with two large fistula repairs and a radical hysterectomy for advanced cervical cancer – what would be an easily preventable disease if Pap smear screening was available. We wrapped up our clinical and teaching work, and then Dr. Mukwege called us together for a final meeting. Earlier in the day, we had seen a magazine in his office in which he appeared on the cover. One sentence in the article stuck in our minds. It said, “Many visitors come here to eat sandwiches and cry, and then they return home.” We had brought a container each day with a sandwich for our lunch, and we had certainly shed our fair share of tears. But we were determined not to be the next in a long line of passive sympathizers. Dr. Mukwege presented us with a flag of the DRC and his words reassured us that he understood our intent and commitment to build a long-lasting relationship in support of Panzi. As we were walking out of the hospital, Dr. Mukwege’s secretary ran up to deliver a message to him. She had just received an e-mail on which she was apparently copied inadvertently. The e-mail, from an American organization at which Dr. Mukwege is scheduled to speak, conveyed concern that his remarks might stray into the causes of the conflict in the DRC rather than strictly the medical response. He sat down on a bench, shook his head and smiled. 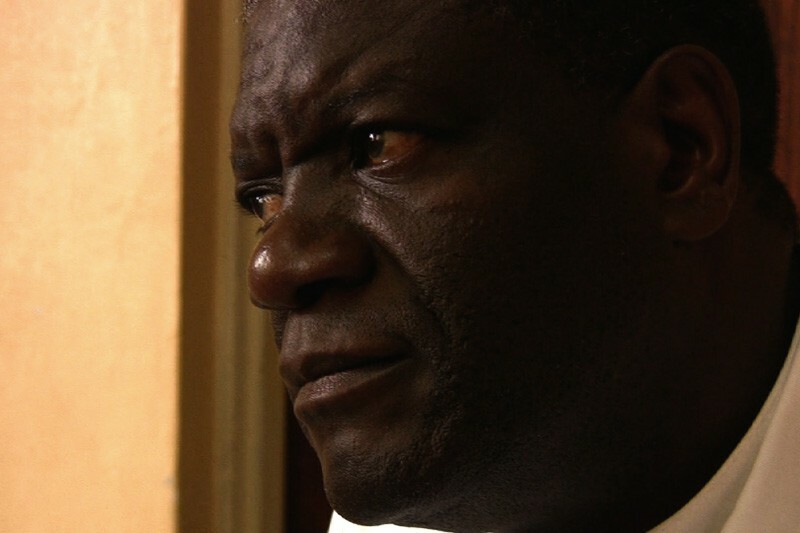 A four-year-old boy wandered over and lay his head down on Dr. Mukwege’s lap. I remembered this boy. On my first day at Panzi, I almost tripped getting out of the car as two little arms grabbed me around the knees. I looked down, and a boy was grinning up at me. He took my hand and led me into the morning prayer service, but then we were separated. Now, Dr. Mukwege stroked his head while we talked. He lay perfectly still for 45 minutes, his eyes closed in contentment. In my right peripheral vision, I saw a young woman staring at him, knitting and undoing the same small crocheted hat as if in a trance. At the age of 15, she had been forced to watch rebel forces kill her entire family and village. She was taken by the forces and held as a slave, during which time she was impregnated by her captors. This boy was the result of that pregnancy. She would stand close enough to watch her son, but could not bring herself to get close enough to mother him. They now both lived at Panzi Hospital. A few days earlier, I had seen him jump into Christine’s car at the end of a long day. She told him she needed to leave, but he refused to let go of the steering wheel. “Take me home, Mama Christine,” he pleaded. As she pulled out some candy to coax him out of the car, there were tears in her eyes, even though I’m sure she has witnessed this routine innumerable times. How could you watch these things day after day, year after year, and not have an opinion on the genesis of the problem or the outline of a solution? Dr. Mukwege had always intended to follow in his father’s footsteps and become a pastor. But he realized that he could not care for peoples’ spiritual needs if their physical needs were so great. And so he turned to medicine. Yet it is clear that no amount of medical care – nor the food and safe haven that he provides – can solve this. The solution, ultimately, will require an open discussion of the root causes of this conflict without fear of reprisals. On Friday night, we drove to Christine’s mother’s house, overlooking beautiful Lake Kivu. The house where Christine was born had been destroyed in an earthquake several years earlier, but a new house had been built just above it. We were joined by Eve, Christine, and Elaine Doughty (the trauma therapist from San Francisco who is training the staff at City of Joy). Christine’s mother treated us to an incredible Congolese dinner, complete with tilapia, feuilles de manioc (cassava leaves), and red beans. Dr. Mukwege arrived and gave the most eloquent tribute to Eve and Christine. Christine stood up and said that her faith was starting to come back. She was referring to a story she had told us the night we arrived. She had been handed a six month-old baby who had been raped. She cradled the baby and drove quickly to Panzi hospital, but the baby had already died. She cried out to God to ask how this could be happening. Alysa, a young girl who had arrived at the hospital at the age of 8 after she and her mother were attacked in their village, ran to comfort Christine. Alysa said, “Christine, sometimes the clouds cover the sky, but the sun is still there.” I had not known or even heard of Christine at the time I began planning this trip, but I recognized this story. I asked Christine if this had happened in May of 2009. She said yes. This was the same story that was told to me by Pat Mitchell in Rochester, Minnesota in late May of 2009. At the exact moment that Christine’s faith had faltered, this story had traveled thousands of miles and lit a flame that we carried back to her. As Bercky said to us when he first picked us up in Bujumbura, it will take many sticks to light this fire. Dancing is a great part of the culture in DRC, and the therapy for the survivors. All week, Eve had warned Dr. Sean Dowdy that she would have him dancing by the end of the week. Those of us who knew Sean were skeptical, but we have witnessed many miracles this week. When we got back to the lodge, we were all very tired. There was no dancing. And we all simultaneously said…..'next trip.'"